Radiata pine dominates Kāingaroa Forest in the central North Island. At 189,000 hectares, it is the most extensive plantation forest in the southern hemisphere. Pine trees were first planted on the Kāingaroa plains in 1900, and the plantation was a state-owned production forest for more than 80 years. 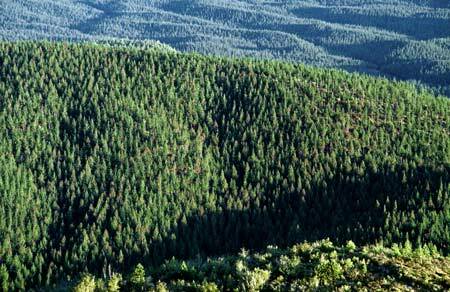 It is now privately owned, and in 2007 was carrying its third crop of pine trees.